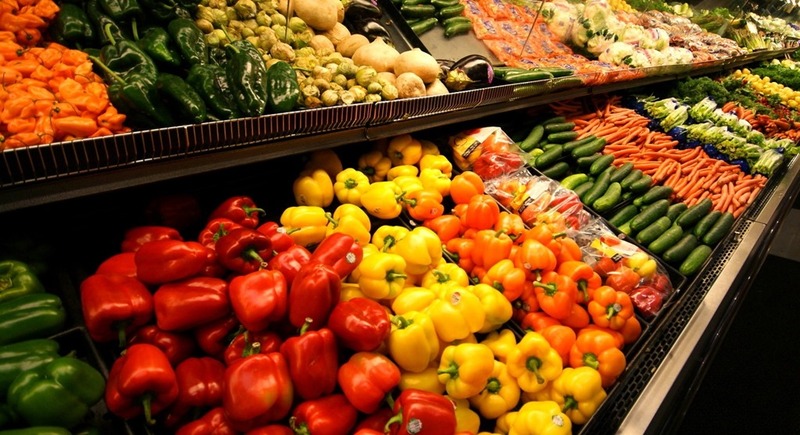 Sometimes, especially in the grey winter, I love to go to produce stores and supermarkets just to look at the colours of vegetables of various kinds. Even an interest in textures is rewarded, and the offerings can vary from season to season. As I live in an area of orchards and vineyards, different seasons bring fruits of different colours, from the dark red of the cherries, to the peaches, pears and plums. All of them delight me, as do the light brown walnuts at the end harvest season. Then everything goes dormant, the foliage falls to the earth and we can rest too… The landscape is a bit dreary during these months, and that is why I like to visit stores to see bright colours, and I get a bit of exercise while doing that too. For various reasons, now retired, we have probably cut down our meat consumption by at least 60%… It helps to live in an area where produce is so abundant, thanks also to local greenhouses that keep us nourished in the winter. While the 100 mile (or 160 km) diet is quiet impractical in Canada, I do try to source things as close to home as I can. Just the other day, I saw at a supermarket some summer fruit or vegetable imported from New Zealand, and it was not a kiwi. I wasn’t even tempted. To the extent that I can, I do like fruits and vegetables in season, and am prepared to wait (with a few exceptions)… When spring is at hand, it is hard to resist those reasonably-priced imported bunches of of asparagus, but when the local asparagus finally arrives, it is so much more flavourful! At this time of the year as we increase the number of vegetables we eat, winter vegetables take pride of place. Lots of root vegetables are in that category, such as carrots, beets, not to mention potatoes, some turnips, squash, etc. This passion for the look of vegetables and fruit has made me explore different ways of preparing them, beyond steaming and stir-frying. Preserving that colour is important. By some chance, I happened to come across a marvelous blog called Inspiralized created by Ali Maffucci. This led me to a kitchen gadget called a spiralizer or Spriral Slicer. I’m a sucker for kitchen gadgets, but I tend to be cautious now. Many of them have been relegated to storage. Two weeks of exploring and researching, including reading the recipes on Ms. Malffucci’s blog, and I decided to order a Paderno Spiral Slicer. It arrived yesterday, and I tried it last night for the first time, a simple recipe of spiralized zucchini noodles with garlic and parmesan. Simple and terrific!! My research has also led me to the idea that I could convert a number of my recipes to incorporate the spiralizing method of cutting vegetables. It means they are more lightly cooked, and presumably retain more of their nutrients. As we tend to have a vegetarian meal in the evening (stir-fry, soup or salad) and the main meal at mid-day, the spiralizer provides lots of new possibilities. I admit that once I picked up my spiralizer from the Post Office, I went shopping and purchased just about every vegetable that can be spiralized. We are now happily eating through the contents of the vegetable crisper. 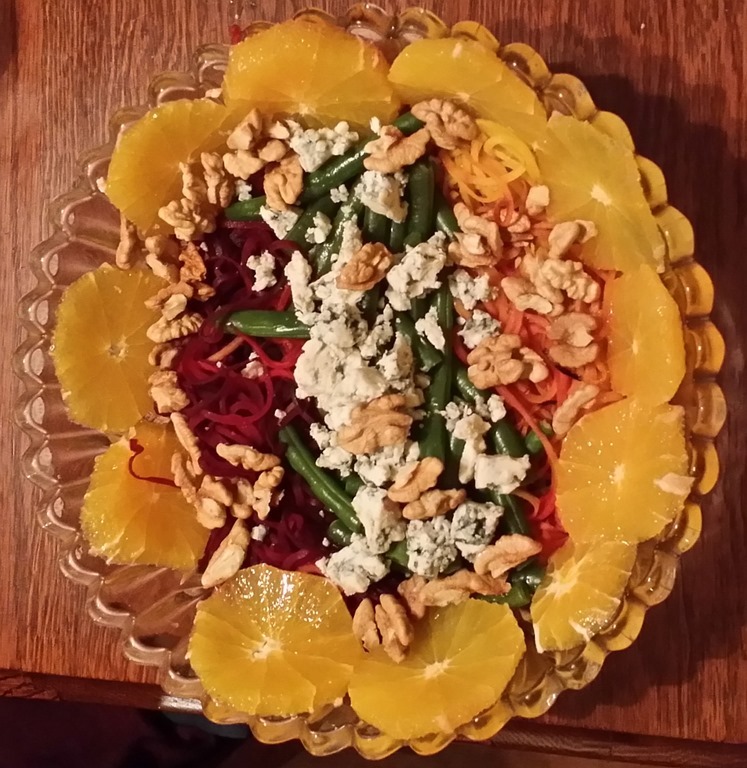 Tonight, feeling a little ambitious, I decided to convert a wonderful recipe for Roasted Beet Salad with Oranges and Gorgonzola with Truffle Honey Vinaigrette. Now I did not invent this one, but the gift some years ago of a small jar of truffle honey had me searching for recipes calling for it. So I came upon this recipe by Robyn Webb. I have enjoyed it a couple of times, and I still have some truffle honey, so I decided to amend the recipe to take advantage of my new gadget. 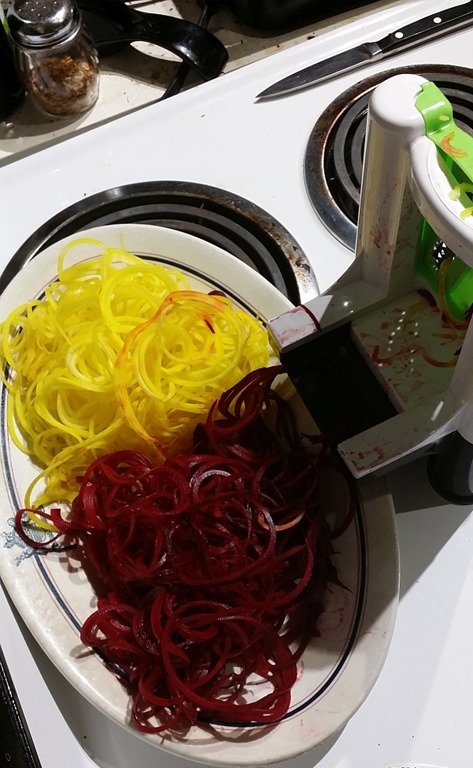 So I spiralized one yellow beet and one red beet! Visually, that was quite stunning! 1. Prepare the dressing by combining all the ingredients in a small container. Stir well. 2. Put the spiralized beets on a cooking sheet sprayed with olive oil cooking spray. 2. Cook beets in a 400° oven for 5 minutes. Let cool. 3. In a bowl combine the beets, greens, orange slices. Pour the dressing over the salad and top with crumbled blue cheese and walnuts on top of the salad. Serve. This was the result. A few comments are in order. First, I had two large oranges. One would have sufficed, but two small navel oranges would also be fine. I substituted steamed green beans, still crunchy, for the mixed greens in Robyn Webb’s original recipe. Very good. If I made this in the summer time, I would use peaches or pears instead of the oranges. And rather than ordinary Danish blue cheese, which I had on hand, Gorgonzola would be my first choice. If using peaches or pears, I would use a milder cheese, such as goat cheese or brie, both of which are great with truffle honey. The dressing recipe above is exactly that suggested by Robyn Webb. The salad could also be individually plated and the ingredients kept separate, no doubt providing a better aesthetic. There is much to be said for individual flavours linked by a common vinaigrette… I think I will try that next time.